This summer, one of the finest golf resorts near Atlanta, Currahee Club, will be hosting two exciting events that are open to the public. On Sunday June 25th, folks are invited to attend The Patriotic Pops Concert, to hear the sweet, melodic strings of the Toccoa Symphony Orchestra. Playing music since 1977, the Toccoa Symphony Orchestra is a mainstay in the community. Each year, the full orchestra of 50 - 60 musicians performs three exclusive concerts with instrumental soloists, and regional vocalists. The Patriotic Pops Concert will take place on the Grand Lawn of the Currahee Club, beginning at 5:00 pm, and a delicious picnic dinner is included with the price of a ticket. Tickets can be purchased online at the symphony's website. 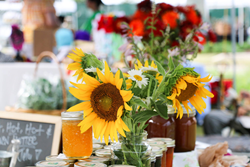 The day before, on June 24th, Currahee Club kicks off its Summer Farmer's Market with more than 50 regional vendors. This will be a fun filled day of strolling through the market on the Grand Lawn of the Currahee Amenity Campus adjacent to Lake Hartwell. In the past, vendors at the market have offered interesting things such as fresh honey, homemade jams and jellies, organic fruits and vegetables, pastries, soaps, lotions, quilts, candles, and other hand made goods. There have also been delightful wines provided by the Currahee Vineyard and dulcimer music by the Yonah Mountain Pickers. Historic downtown Toccoa, with eloquent old buildings, museums, monuments, restaurants, coffee shops, a gift shop and bakeries. And of all the golf resorts near Atlanta Real Estate Scorecard has explored, they believe Currahee Club is by far one of the best for lakeside retirement. Surrounded by the picturesque Appalachian Mountains, the community's 18-hole championship golf course is an incredible sight to see and play. It’s won dozens of awards that include Top 100 Best Residential Golf Courses in America, GolfWeek Magazine 2017, Best of the Best Real Estate Communities Edition Ideal Living 2016, #1 Golf Club in Georgia, Top 4 in USA National Golf Course Owners Association in 2015. While enjoying views of Lake Hartwell and the Appalachian Mountains, players face rolling fairways, generous sloping greens and the famous 17th hole that plays over the site of an old quarry. And if golf is not one’s game, Currahee Club also offers fitness, tennis, swimming, volleyball, bocce ball, basketball and more. The club’s 48,000 square foot clubhouse is one of the most beautiful clubhouses they’ve seen in the south. Living on Lake Hartwell, residents of Currahee Club enjoy an adventurous life by the water. The lake is filled with bass, crappie, walleye, catfish and carp. And there is a very active boating scene within the gated community. Whether folks enjoy pontoons, ski boats, sail boats or kayaks, there are plenty of excellent ways to spend a sunny day on the water. There are plenty of islands, beaches, and quiet places to explore for a warm summer dip in the lake. Homes at the club are impressive. Check out this 3 bedroom, 3.5 bath, 1700 square foot Currahee Club home for sale listed for $399,000 from renowned architect Keith Summerour. This quaint and charming masterpiece is the epitome of a classic countryside cottage, with elegant features and an open design that inspires family interaction and entertainment, with effortless flow from kitchen and dining room to great room. The Woodborough features a great room with vaulted wood ceilings, gourmet kitchen and a massive screened porch that overlooks the fairway of Hole #8 of the Fazio-designed golf course. The master is located on the main level, with two additional bedrooms and baths located on the upper level. The upper level also features a loft, perfect for an office or den. After visiting over 100 mountain communities, they can say with confidence offering high quality homes in the mountains under $400,000 is quite an achievement. Homes in the community range from the high $300’s to over $1 million. When folks attend the event, they will have the opportunity to tour fully-furnished model homes, and experience the Southern charm, inimitable taste and overwhelming inspiration community embodies. Boomers and families alike exploring golf resorts near Atlanta for lakeside retirement, won't want to miss this opportunity to explore one of the most affordable mountain towns in Georgia and the club. Call Currahee Club directly to schedule at 888.560.2582 to obtain tickets and/or schedule a visit.